← Spitalfields Revisited. Photo: Paul Barkshire, text David Secombe. Spitalfields Market. Photo & text: David Secombe. Posted: October 13, 2011 | Author: thelondoncolumn | Filed under: Churches, Literary London, London Places | Tags: east end, Jack London, Thomas Cook |Comments Off on Spitalfields Market. Photo & text: David Secombe. Photo © David Secombe 1990. “But you can’t do it, you know,” friends said, to whom I applied for assistance in the matter of sinking myself down into the East End of London. […] “Why, it is said there are places where a man’s life isn’t worth tu’pence.” “The very places I wish to see,” I broke in.”But you can’t, you know,” was the unfailing rejoinder. “You can’t do it, you know,” said the human emporium of routes and fares at Cook’s Cheapside branch. “It is so – hem – so unusual. […] We are not accustomed to taking travellers to the East End; we receive no call to take them there, and we know nothing whatsoever about the place at all.” “Never mind that,” I interposed, to save myself from being swept out of the office by his flood of negations. “Here’s something you can do for me. I wish you to understand in advance what I intend doing, so that in case of trouble you may be able to identify me.” “Ah, I see! should you be murdered, we would be in position to identify the corpse.” He said it so cheerfully and cold-bloodedly that on the instant I saw my stark and mutilated cadaver stretched upon a slab where cool waters trickle ceaselessly, and him I saw bending over and sadly and patiently identifying it as the body of the insane American who would see the East End. 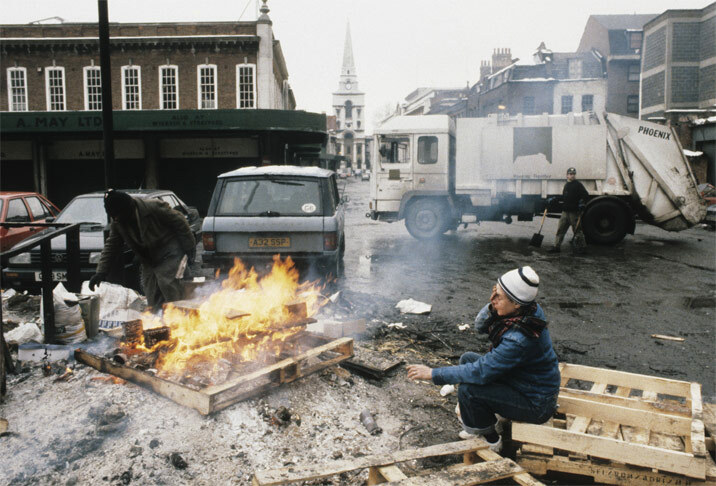 The photo above was taken twenty-one years ago, and shows homeless people lingering around a bonfire of pallets near the old Spitalfields vegetable market. Hawksmoor’s majestic Christ Church is seen in the distance. Spitalfields used to be cited by ‘psychogeographers’ as one of those London locales where the sad history of the city was engraved upon its streets and buildings: a place that was permanently wrong. The district’s association with poverty, with Jack the Ripper, the waves of the dispossessed that have settled over the centuries – this stuff was meat and drink to the likes of Iain Sinclair and Peter Ackroyd. For his part, Jack London’s attempt to discover the Edwardian East End bore fruit in a book which documented in depressing detail the squalor of Spitalfields, and included photos of down and outs sleeping against the walls of Christ Church. In the 1960s there were moves to demolish the entire area – including Hawksmoor’s church – and the time-locked deprivation of the Georgian district was eloquently pictured by the makers of the film based on Geoffrey Fletcher’s London gazetteer The London Nobody Knows, and by photographers Don McCullin, Paul Trevor and (later) Marketa Luscacova. My picture dates from a moment just before the wealth and bombast of commercial London annexed the neglected East End. Spitalfields’ desirability as a property market perked up considerably around this time; long-term residents like Gilbert and George, Dan Cruikshank (who had been one of the original squatters who had helped save the area from destruction in the 1970s) and the American artist Dennis Severs, whose house is now a museum, acted as beacons of gentility amidst the inner-city gloom. And, as the 1990s rolled on, the East End went from being the Dark Heart of Old London to Shiny Retail Zone with bewildering speed. I remember laughing at my first sighting of Japanese tourists apparently lost in Shoreditch circa 1997 – but it was, I think, the same year that a Holiday Inn opened on Old Street. A visit to Spitalfields Market today is a trip to Covent Garden East: visitors are safe to purchase their branded goods and speciality coffees in a shopping environment free of disquiet. London Gothic has been displaced by Consumer Bland. It gives the lie to the theories of Ackroyd and Sinclair: with enough commercial pressure, any area, no matter how dark its history, can be transformed into a playground for contented shoppers. Cultural amnesia driven by money. However, given the recent unemployment figures, there may well be opportunities for a resurgence of old-fashioned Victorian deprivation in the East End, although this time it will be hustled to the margins of Whitechapel, Mile End, Barking, etc. D.S.